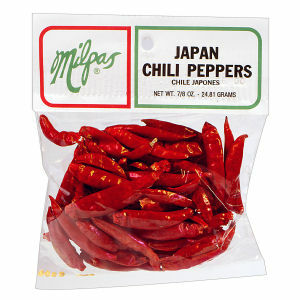 Dried chile "Japones" is a cousin of the very popular "chile de arbol". The only difference is in size, with the chile de arbol being a tad smaller, yet packing a good punch in the "heat" category! Our Milpas chile Japones can be used in salsas and even whole in dishes needing heat. As with all hot spices, less is best. And Milpas is always the best.